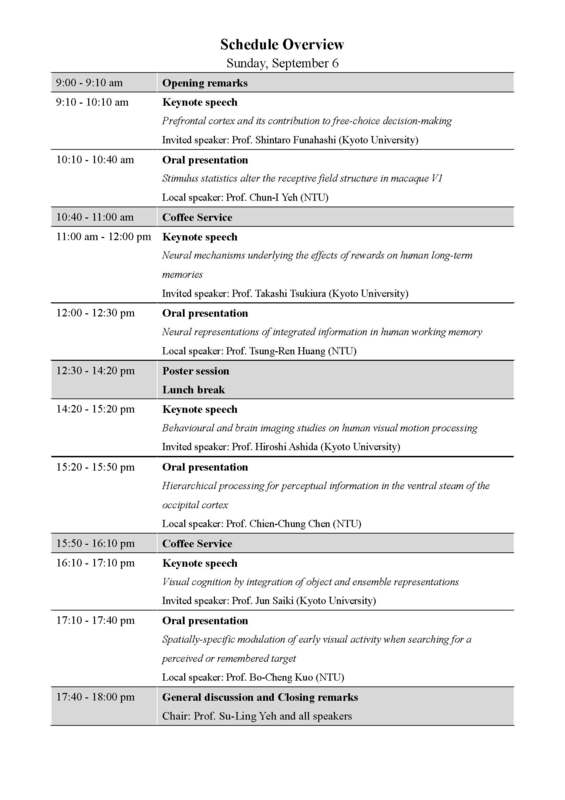 Join us for the NTU-Kyoto University Cognitive Neuroscience Symposium: Mental and Neural Representation for the Environment at the National Taiwan University (NTU), Taipei, Taiwan. The 2015 NTU-Kyoto University Cognitive Neuroscience Symposium will feature an important scientific program of keynote lectures, oral and poster sessions. This symposium brings together researchers from diverse backgrounds, all with a focus on the relationships between the mental and neural representations for the environment. The Committee now welcomes submissions for abstracts for poster presentation!!! Closing date is 20th August, 2015. Date: 9AM – 6PM, 6th of September, 2015 (Sunday). This symposium is supported by the grant from the National Taiwan University Cutting-Edge Steering Research Project (Research title: Neural and Mental Representation for the Environment - Perception and Memory of Statistical Regularities). A graduate-level course, Functions of Neural System, was attached by the project and the symposium.